The PCI-7396 is 96-bit parallel digital input/output (DIO) cards designed for industrial applications. 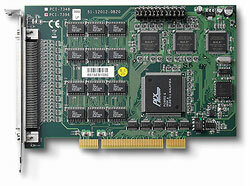 The PCI-7396 emulates four 8255 Programmable Peripheral Interface (PPI) chips. Each PPI offers three 8-bit DIO ports which can be accessed simultaneously. The total 12/6 ports can be configured as input or output independently. The PCI-7396 devices feature external trigger to latch the digital input data, and also provides "Change-of-State" (COS) interrupt, which means when any of the digital inputs changes its state, an interrupt will be generated. Users can power up the PCI-7396 digital I/O lines in a user-defined state - either high or low, by simply setting the pull-high/pulllow resistors with a jumper.